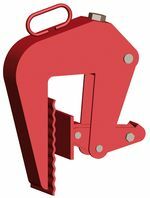 This three-leg chain sling with self-tightening grips is perfect for lifting and transporting concrete pipes with a diameter between 1,300 and 2,300 mm. The pipes may have a wall thickness from 60 to 150 mm, with a maximum weight of 2,500 kg. The concrete pipe lifting sling corresponds to the pewag factory standard and may be used in a three-leg chain sling with an inclination angle of up to 30°. For safety reasons, the grippers must not be used for diagonal pull. The maximum operating temperature is 100°C. A full operating manual provides information on all features and areas of application. Customs lengths are available upon request! Note: BRG assemblies are also available with pewag winner 200 chain.